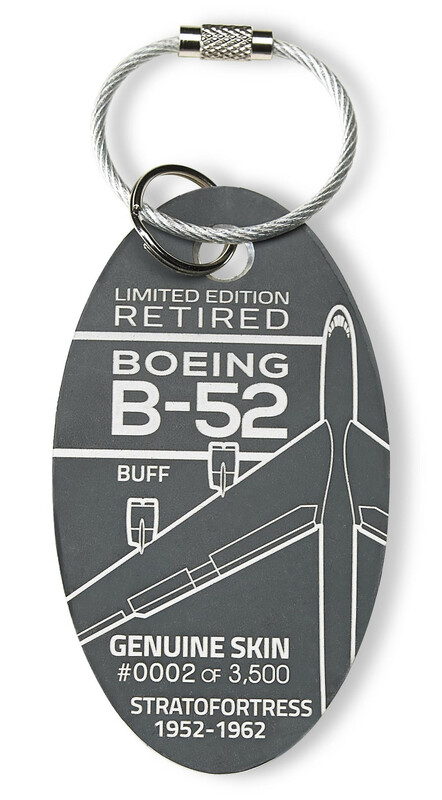 This B-52 Stratofortress PlaneTag is made from the wing flap of this long ranged jet-powered strategic bomber. Originally designed to carry nuclear weapons during the cold war it has proved it is versatile and ageless. From 1952 to 1962 there were 744 units produced. Rebuilt and upgraded, the B-52 has served proudly for 64 years and still plays a major role in our country’s defense. Affectionately called "BUFF" by its aircrews which stands for Big Ugly Fat Fuc*&r.
Unfortunately we do not know the Tail # on this PlaneTag. The B-52 PlaneTags were made from the inside wing flap from the Bomber. A Homeland Security law that went in place in 2001 now restricts anyone from taking B52 parts. 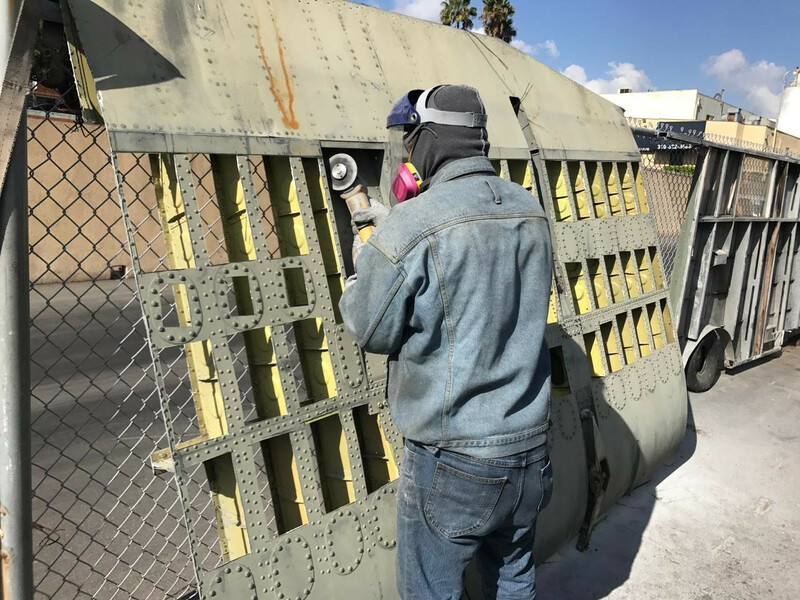 However, these B-52 wing flaps were purchased in Tucson, AZ shortly after the laws had changed and they were grandfathered in. Your Boeing B-52 Stratofortress was made from the wing flap of a retired B-52 bomber. NOTE: PlaneTags are made from actual retired aircraft fuselage, not merely stamped metal. 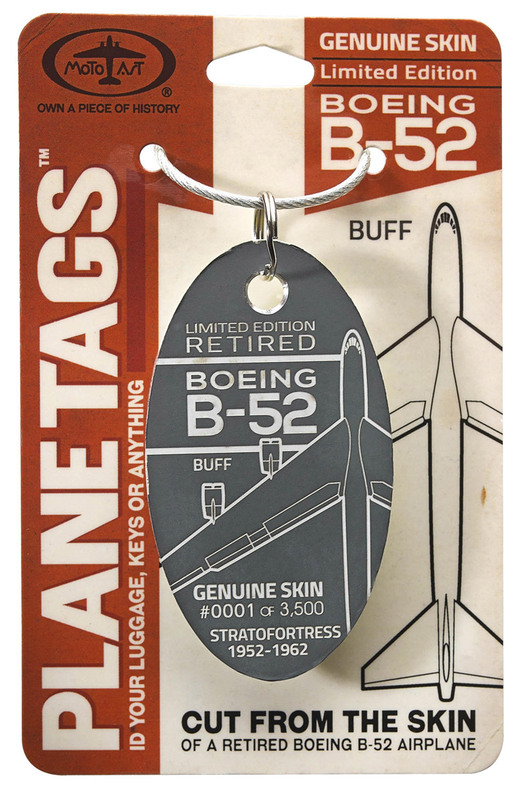 Because PlaneTags are made from real fuselage, each PlaneTag bears the color, thickness, and wear and tear from the portion of the fuselage from which it was cut and it is therefore rare to create two identical PlaneTags. These variations and imperfections are not product flaws. They are part of the beauty of PlaneTags. As a result, you will not have an option to select the color of your PlaneTag. The images on this website are provided for reference only and should not be used as the sole basis for choosing a particular PlaneTag. Pros: Info looks to be cut into the skin so will last a very long time. Review: You can make a million of these from one B52 my tag shows a total of 3500, and that it was made from the Wing Flap. If you have ever seen a B52 up close they could have made all of these from one flap. I have a very close friend that flew the B52D. He has some great stories, so this is a part of his life, and other friend that loaded bombs onto B52's. To think a bird this big can carry that much weight and has a skin this thin can fly that many years, is amazing. Very cool a part of history. Review: Being retired Air Force and familiar while in Vietnam on the missions flown it made a great keepsake. Wish they had one for the C-123K aircraft that I flew on.